Ohh, how SWEET the season! New year, new networks! 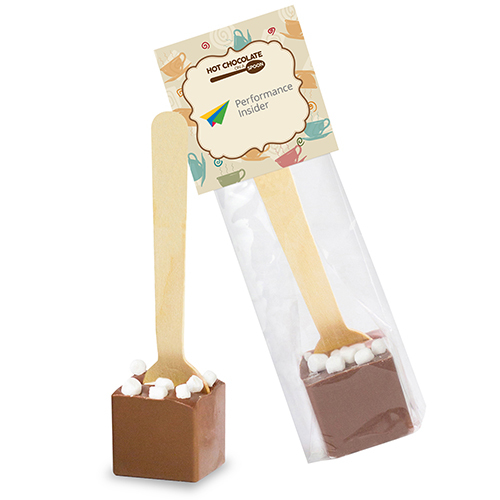 What better way to revamp your marketing strategy then with a sweet, sweet chocolate bar to break the ice. What is SOO great about this item is that you can customize the 40-piece bar into words and phrases of your choice! This is the perfect way to send out unique THANK-YOU messages and holiday greetings! Customize the gift box to a color of your choice with a custom imprinted gift-band at NO EXTRA CHARGE! With Valentine’s day around the corner, this chocolate bar goes great as a personal gift or an appreciative measure to those in your office. There will always be a reason to celebrate, so make it a SWEET one!! Customize your 40-piece Chocolate bar to give thanks or to wish happy holidays! During the holiday season it is always nice to spread cheer through your office by giving your employee’s a gift to let them know you care and appreciate the work that they do. When searching for the perfect office gift you don’t want to spend too much money and buy everyone a new car, but you don’t want to just give everyone a new stack of post it notes either. A gift that everyone will appreciate is a Chocolate Inn 2 oz bag of Chocolate! You can chose whether you want to give these little holiday delights in a gold or silver bag and what’s inside. Chocolate Inn offers four different varieties of chocolate treats; Chocolate Espresso Bean, Dark Chocolate Almonds, Milk Chocolate Cashews, or Bridge Mix. The Kosher Certified Premium Swiss Chocolate products have an incredibly long shelf-life of one year. The bags themselves can be customized with your company logo making them even more personal.